Microsoft announced this week the features gamers in the Microsoft's Xbox and Windows 10 preview programs can look forward to soon. 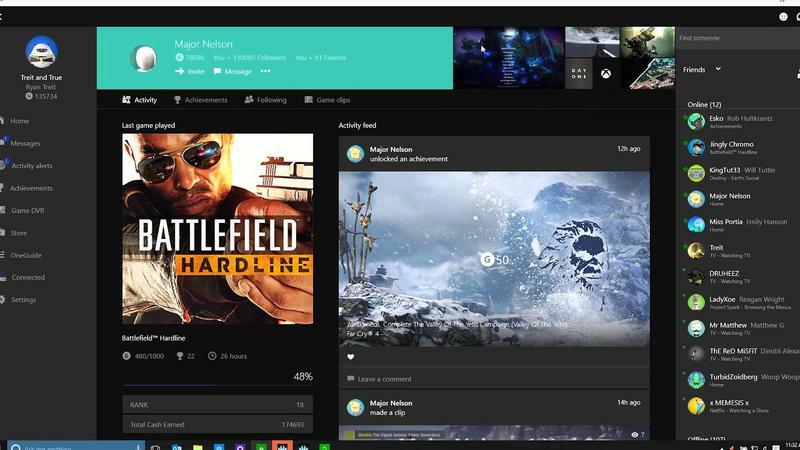 Most of what Major Nelson had to show off this time concerns the Xbox app for Windows 10. The Game DVR feature, similar to the Xbox Record That functionality on Xbox One, will allow you to record footage of the game you're playing by pressing the Windows key + G. From there you'll be able to record recent gameplay, start and stop recording footage at any moment, or take a screenshot. Along with this is a more granular set of features for how Windows goes about recording that. Every Xbox One is the same, but most PCs aren't and, as a result, have different resources available. The options should help gamers be able to use the feature without harming their game experience. Also coming to the Windows 10 preview is the return of Microsoft's Xbox avatars in a standalone app that allows you to customize your avatars on the PC using any items you've purchased from the store or unlocked in games previously. Smartglass media controls are coming to the Xbox app as well, making it possible to control video from the app from a Windows 10 tablet or PC. Perhaps the coolest feature, though, is another port from Smartglass: the ability to stream live television from your Xbox to your PC. If you're using the Digital Tuner (in Europe) or the Hauppauge 955Q (or upcoming official Xbox U.S. tuner), you'll be able to watch television on your PC. This will be available in those apps on Windows 8 devices as well. Coming to Smartglass is the ability to power the Xbox One on and off from the app. The beta versions of the Windows, Windows Phone and Android app will be getting this first, and you have to be in the same home as the system to do it. If you're looking to stream television to your PC or tablet elsewhere in your home, though, this could be a very convenient feature. Finally, Miracast is coming to Xbox One. Using Miracast, you'll be able to – you guessed it – mirror your screen from Windows PCs, Windows Phones, and some Android devices, and share any non-protected content across that connection. To access these features right away, you'll need to be part of the Xbox and Windows 10 preview programs, but this is a good preview of what we can look forward to doing when Windows 10 hits officially later this summer.